40mm Orange Octopus Eyes Taxidermy Irises Nautical Steampunk Creature for Art Doll Sculptures or Jewelry Making Crafts by Megan's Beaded Designs at Designers Artists. MPN: HW_BDC90192-40. Hurry! Limited time offer. Offer valid only while supplies last. Featuring unique eye designs, that I created digitally, these cabochons are sure to make your creations a hit! Perfect for doll or jewelry making. 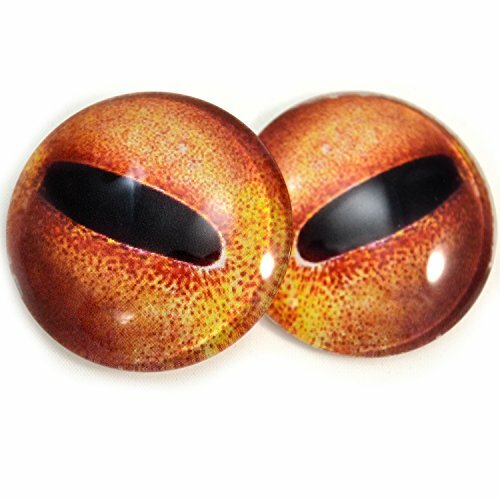 Set of 2 mirrored 40mm orange octopus glass eyes for jewelry making, doll sculptures, taxidermy, scrap booking, and more. These are intriguing glass eye designs in bright orange are sure to make your art projects a hit! This listing includes 2 mirrored extra large handmade glass eyes. Woodpeckers Decorative Wooden Doll People - Assorted Sizes - Set of 40 Includes 5 Shapes: Ebook: We Include a Ebook with Cool Crafting Ideas.